Today I am promoting a service on Literary Career Moves. We offer plenty of services for authors and writers. As an author and avid reader, I understand the process of writing a book and wanting it to be well received by your readers. I am now offering the Sit and Read service for authors who are interested in having their book read by an outsider who will give extended confidentiality and give honest feedback about the writers work. A free career path book. Book will depend on where you are in your career path. Inquire about this service today! Today I am promoting a service on Literary Career Moves. Literary Career Moves is now taking new clients. Clients are not just people I take money from. I help authors and writers seek their place in their career and expand and advance where needed. This package includes a “from beginning to end” service for you and your book. Dominique will consult with you via email, phone, chat, in person etc throughout the 6 months helping you with your literary needs. $199 is a one-time fee that spreads over 6 months so Dominique can help you with all of your needs. This package allows you to become a “priority” client. Your literary needs will always come before those that are not special mentor clients. You will receive all of Dominique’s books, will not be charged with individual phone consultations or guides written up for your career. This includes Dominique’s research for you on specific topics and getting you the answers you may not be able to find on your own, helping you with your query/proposal/bio/byline, critiquing your 4-6 chapter manuscript, giving you a three month workshop to help in creating your characters, outline etc. Also, writing a path guide for your literary career. Inquiry about this service today! Welcome to the second issue of AuthorZine. Bios are one important aspect of being an author. We want our readers to know all about us and what we’ve done. Any author can have a bio and can write it themselves. It’s what’s in the bio that stands out to the person reading it. Bylines are important too and every author must have one. Today, let’s take a look at the important parts of a bio and the necessity of a byline. The bio is about you but be careful with what you place in your bio. Do not include anything unnecessary and do not make it two or three pages long. Readers do not want a report or essay, they want a bio. Make sure it’s sweet and simple. Do not cloud your bio with a bunch of words or unnecessary phrases about yourself. What are you famous for? Anything you have done that is popular? Be sure to have fun with your bio. Remember it’s all about you. If you are having trouble writing your bio you could ask someone else to do it for you or have them give you a few facts about yourself as an author. If your bio seems to be a bit long, create a shorter version in case you are asked for it later. Having a short and long bio is good as well. Bylines are one maybe two lines about the author. Many bylines are included in articles, magazines or other literary works but sometimes when being interviewed you may be asked for a byline. In case you are asked for a byline, create one to two lines about yourself. This is short and sweet; simple. I am letting my readers know who I am and what I do with just a few words. Have this type of write up handy. 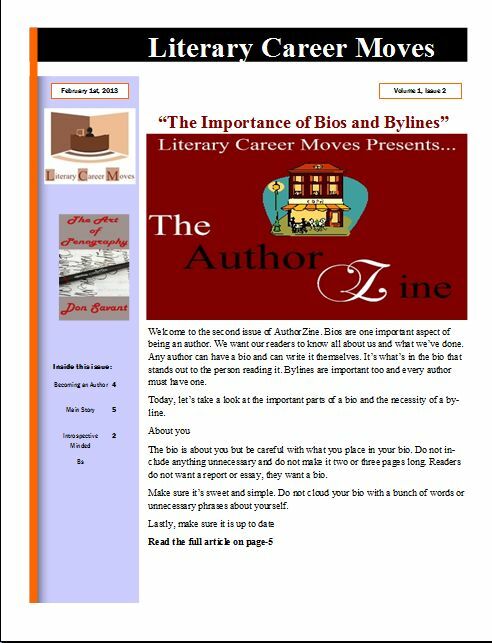 Bios and bylines are something that is always asked for when inquiring about a book review, interview etc. Have these things up to date and ready. I would suggest updating it once every month. Do this often especially if you are someone that has a lot going on. Think of your bio as your resume for a job. People want to know why they should consider you and your work. Make it worth their while! It’s that time of the week again for me to promote a service on Literary Career Moves. Many authors self publish but there are a lot of authors that still wish to go the traditional way. It may be longer, more stress but sometimes it pays off. For those who are interested in taking this route, Literary Career Moves offers the Query/Proposal Preparation Service. -This service will get you the help you need in writing your proposal & query. It comes with a PDF document that will guide you through creating the proposal and query with do’s and dont’s and an example proposal and query. Dominique will also walk you through getting the proposal and query together for an agent or publisher. -Professional editing of your Query & Proposal from one of our vendors. Literary Career Moves released the second issue of “The AuthorZine” Featuring Author and Poet, Don Savant in our new segment, Introspective Minded by Darryl Mims. Download the new edition today for free and find out how you can get featured! Have you read the new ezine? Tell us what you think! It’s that time of the week again where I promote a service on Literary Career Moves. Today I am promoting our service for writing critique. Every author or writer needs someone to critique their work. Remember, there is always room to grow. You should consider having a friend or relative you trust read your work and give feedback. There are times you also want a professional to give good feedback to help you in your craft. Literary Career Moves provides that. View below this week’s promotion and sign up today! -Deeply analyzing your work for the genre of work you plan to publish in. Letting you know if writing workshops will help you or if you are ready to move forward with publishing. -A free career Path book. Book will depend on where you are in your career path. Today I am promoting a service on Literary Career Moves. This promotion is important because many times authors really do not know the steps in getting their books in the right hands or how to simply publish a book. With this service, I help authors and writers find their way through publishing their book. Basically holding the author/writers hand and guiding them all the way, answering whatever questions they may have. Do you think this service is for you? Inquire today! -this service includes guidance through the entire publishing process. Once a publishing company is chosen Dominique will help you in knowing what parts of the publishing services are most important to you and getting to a completely satisfied state with your book.